Strategically located in the southwestern part of India, Kerala enjoys unique geographical beauty. A narrow strip of land sandwiched between the Arabian Sea and the Western Ghat Mountains has today become referred to as “God’s Own Country”. With its amazing natural beauty, breathtaking backwaters, lovely beaches, picture perfect hill stations, exotic wildlife parks and sanctuaries, terrific temples, historical forts and a rich and vibrant culture has made the small state of Kerala one of India’s most desirable destinations. Kerala is predominantly famous for its breathtaking backwaters which are gifted with amazing beauty and provide wonderful opportunity to explore the rustic charm of Kerala, its beauty of Nature, terrific temples, astounding scenic vistas and traditional relaxed way of life. Windows of scenic beauty start to open as you cruise from the comfort of your private luxury houseboat, offering glimpses of palm and coconut trees lined interconnected waterways along which lie cantilevered Chinese fishing nets, small towns and villages with churches, mosques, temples and schools, cascading waterfalls, historical forts and exotic boutique resorts. 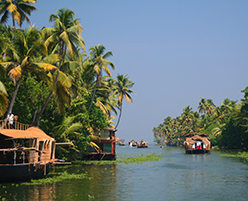 Cruising through the picturesque backwaters will truly be the enchanting experience. When you dream of faraway tropical paradise where you can escape the hustle and bustle of everyday life then it’s time to discover Kerala; Soothing and rejuvenating as you relax and be pampered on some of India's most beautiful beaches; Sweeping stretches of golden sand, swaying palms, warm sea breeze. Almost the southern tip of Indian landscape, Kovalam is one of the most beautiful beaches on earth and even today it still retains a secluded charm. 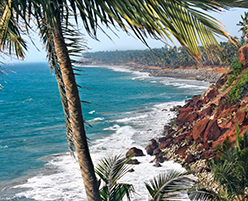 Kovalam is the tropical paradise in the true sense.